A while back on my Facebook page I asked about making myself a Retro Romper with the leftover fabric I had from the samples I made for pictures. I was half joking, because I’m not a fan of rompers on adult women because I don’t want to strip to go to the bathroom. Well, luckily I didn’t have to make that call, because I only had enough fabric for shorts anyway. So I made a pattern and sewed these up to pacify my nostalgia. And I’m going to be using this pattern next week, too, for something totally different. Want to make yourself some (maybe you have a nostalgic streak too)? 1/2 yard of knit fabric. I used stretch French terry. 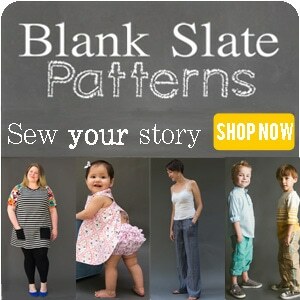 The free pattern is in a women’s size small, for hips up to 36″ and waist 28″. 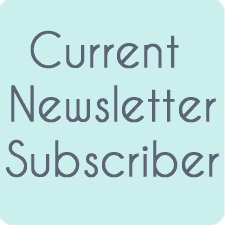 To get it, click your preferred option below to get the free pattern only as a newsletter subscriber. 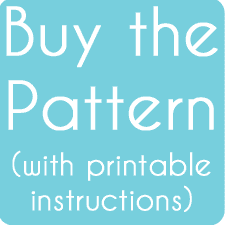 Or you can purchase the full digital pattern + printable instructions in sizes XXS-3X. 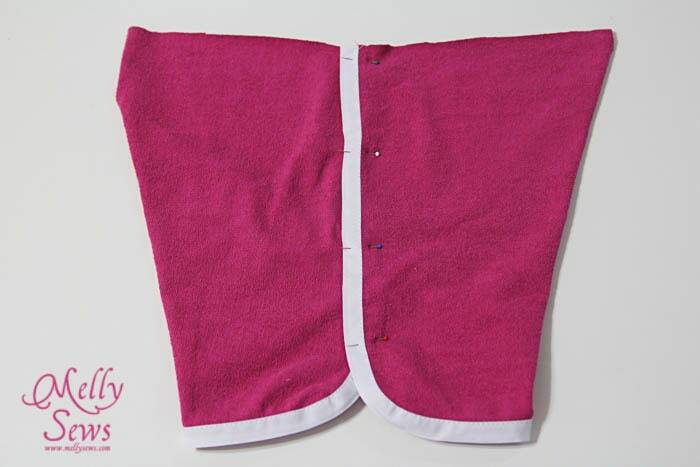 Please note that the purchased pattern has a separate waistband piece, but it also includes instructions to attach that. And it has POCKETS! OK, after printing, taping and cutting out the pattern, you’ll take one front and one back and sew them right sides together at the inseam. 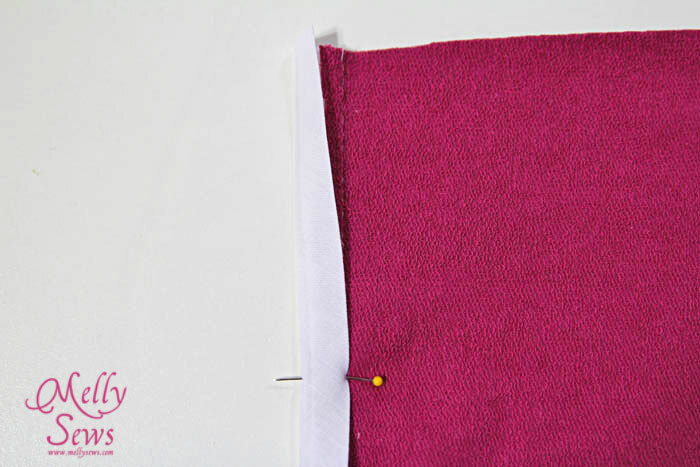 USE A 1/2″ (12mm) SEAM ALLOWANCE. 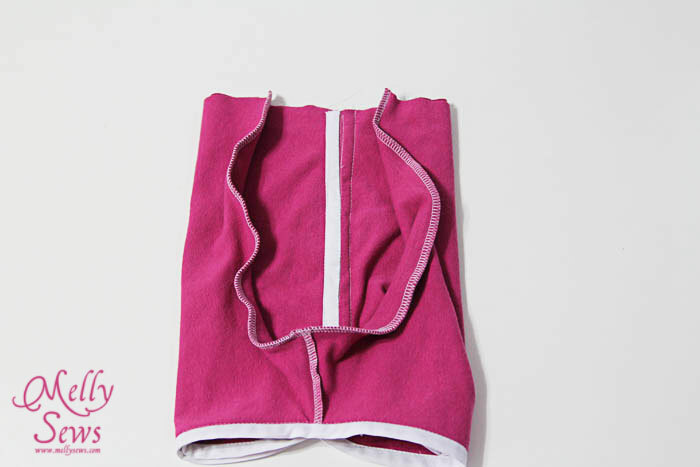 When you open the shorts out flat, they’ll look like the picture shown below. Repeat with the other front and back piece. Then you’re going to pin bias tape on. (Want to make your own bias tape? 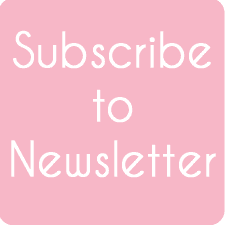 Check this post.) With wrong side up and the bias tape opened flat, pin around the edge as show below. The bias tape should be even with the edge of the fabric. It doesn’t look like that in the picture because it was curling, but it is. At the curves, ease the bias tape around, making sure the fold line in the tape is flat. Stitch on the fold line of the bias tape that is closest to the edge of the fabric. Repeat this on the other leg. 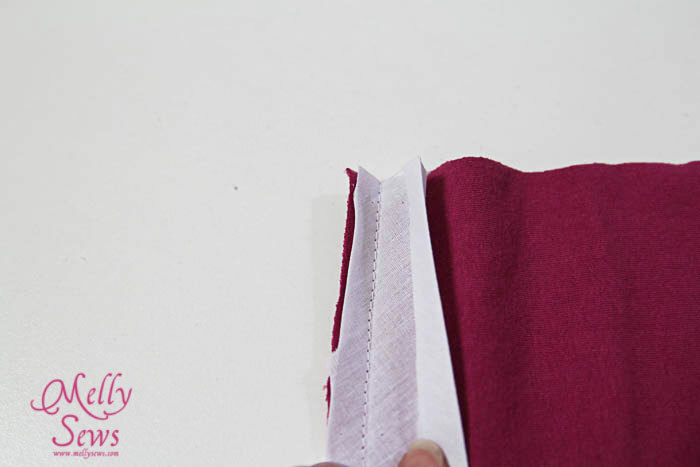 Fold the bias tape onto the right side of the fabric, covering your first stitching line. Stitch it down close to the edge, so your bias tape is now securely wrapped around the raw fabric edge. 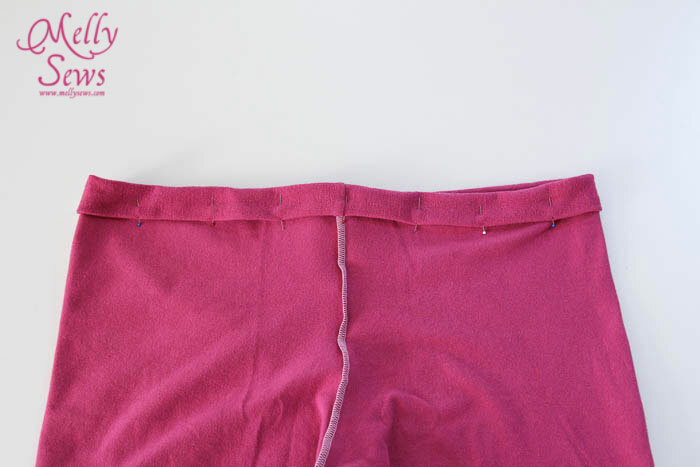 Now place bias tape on the side seam of the front side of the shorts over the bias tape on the side seam of the back side of the shorts with right side out. Pin in place to where the side seams start to curve away from each other. 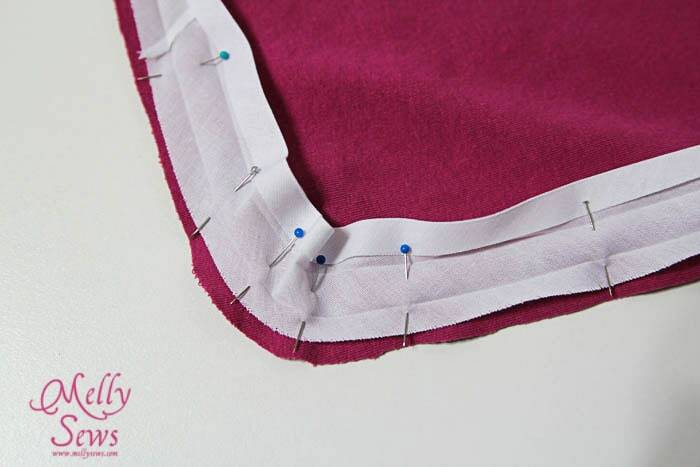 Stitch down the unstitched edge of the bias tape on the front piece to secure the side seam in place. Repeat with the other shorts leg. Be careful not to sew through the other side of the leg as you sew the bias tape edges on top of each other. 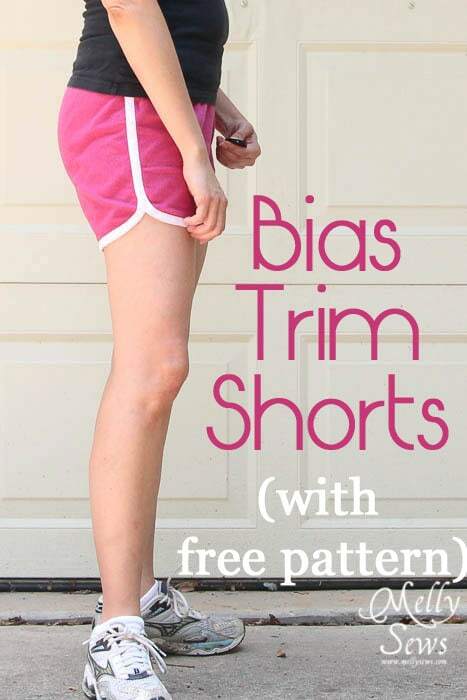 Place one shorts leg wrong side out, with the curved raw edge side facing right. 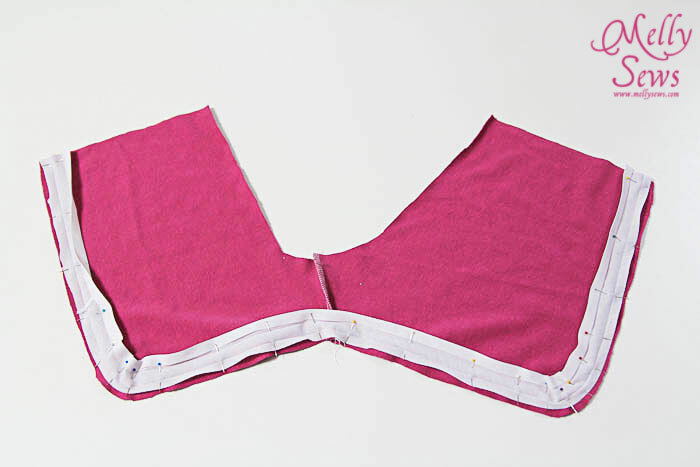 Place one shorts leg right side out with the curved raw edge side facing right. Put the right side out leg INSIDE the wrong side out leg. Match the curved raw edges in a U shape. 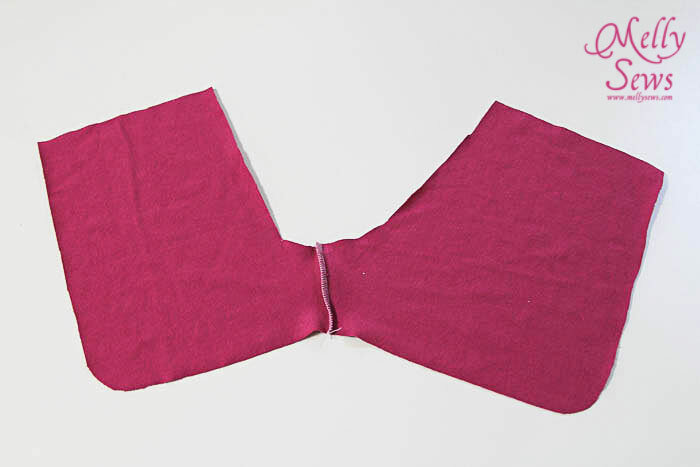 Sew them together, creating the center crotch seam. Turn shorts wrong side out. Fold down the top edge 1/4″ (6mm). Fold down the top again 1 1/4″ (30mm) and pin. Stitch the bottom edge to form a casing for the elastic. The casing might be rather thick at the side seams where the bias tape is – you might want to hand crank your machine here. Leave an opening in the casing so you can insert the elastic. 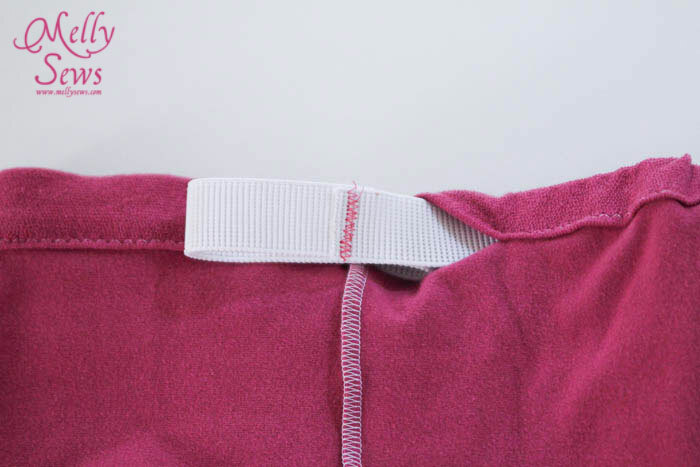 Use a safety pin to feed the elastic through the casing, being careful not to twist it. Sew the elastic ends together, then sew the casing closed. And take them out for a run! (Note – I totally did my hair and makeup for this picture – I typically run with a ponytail and a VERY red face). Also, these shorts might have magical faster running properties – look at my hair fly! These shorts are great! I better try them if they will make me a faster runner! Such cute shorts! I love the colour of yours! Thanks for the pattern and tutorial. Love these! I always “need” more running shorts 🙂 I want to try them in a fun, bright color! Awesome! My 25 year old daughter was just asking for some of these shorts! I was so happy to see your post! I went into target at the beginning of summer looking for shorts and maybe found 3 styles! All super short or tight and not what I was looking for! I cannot wait to make myself a few pair that can be custom just for me! Thanks so much! I want to make some of these for my family! What kind of thread do you recommend for making such items? I seem to buy the wrong thread that breaks when people wear the clothes, even when they are loose fitting. Kristin, Maybe the thread is not the issue, but the stiches. 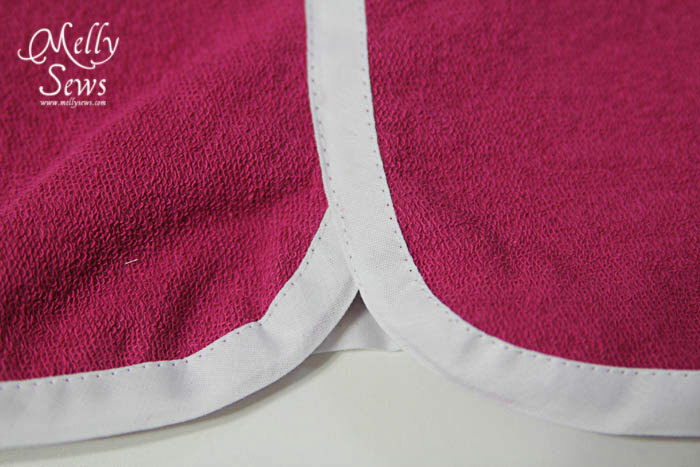 For stretchy fabric you cannot use straight stitches, for the fabric will the strech and the stitches will not. So you need to use a ‘zigzag’ or something more sophisticated. I found Your tutorial via Pinterest and absolutely plan to make it for the summer! Is the 12 mm Seam Allowance already included in the pattern or do I have to add it when cutting the fabric? 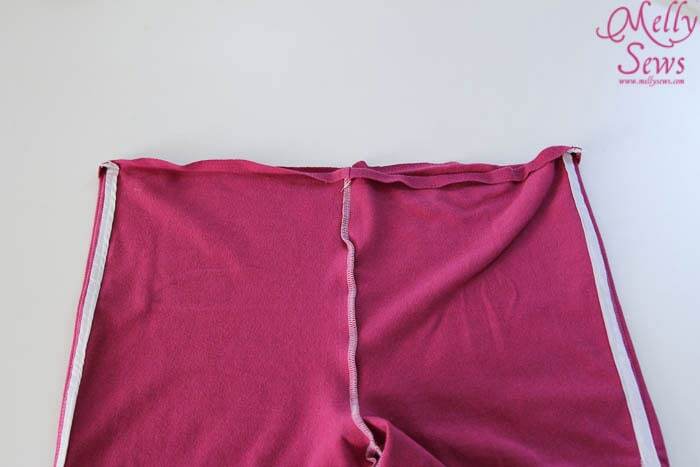 HELP — I can not figure out how you get the front and back center seams sewn — I got the first join of front and back at inseam in Step 1 — bias tape done no problems — try to figure out how to put one leg in another and join the center seam (not sure if this is front and back center … just front center … not sure). I have spent 3 days working on this and can not figure it out. Is there any clearer way to say this? Place one shorts leg wrong side out and one right side out. Put the right side out leg inside the wrong side out leg and match the center seams in a U shape. 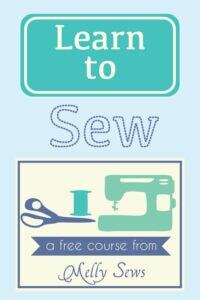 Sew the center seam. I keep thinking I have missed a step, or maybe put two of the pieces together wrong, but going through the steps before everything else seems fine and it matches the pictures. My shorts just currently look like a skirt. Any help/guidance would be most excellent. Either way, I really appreciate the pattern. Also I up sized them the way you showed, and they fit perfectly. And I’ve never sewn any bottoms of any kind before!!!!! Any idea how I can modify these to fit a guy, or where I can find a men’s pattern? I need to make some in silver lame for a halloween costume… and also to wear and look AWESOME in. Of course I’m no small guy either, so there’s no way I could just make the women’s ones and have them fit all the areas right. Any advice? though that pair is much looser than this pair. So I’d also find some cheap fabric to make a sample pair (or more) before cutting into the lame. I ended up heavily modifying a boxer short pattern and thought through the measurements for how we wanted them to sit and hang. I actually had better luck with the bias tape when I didn’t pin it, rather I just lined it up as I went. When I pined it it would almost always wrinkle and I’d have to rip stitches out and redo it. What’s really funny is a compared my final pattern (which is probably a Men’s XL) to your pattern… it’s almost twice as wide… which I expected… but it’s only half as tall. Although some of that probably has to do with the fact that guys wear their shorts on their hips rather than their waist. That, and they’re pretty short by design lol. Ultimately the shorts came out awesome and I can’t wait to make a second pair from the pattern once I’m done with all the costume stuff I’m working on. Thanks for the inspiration!